The chairman of the Iowa Republican Party is questioning the Democratic candidate for governor’s involvement in a state grant to DuPont Pioneer for the cellulosic ethanol plant that closed in Nevada last year. The grant was approved when Fred Hubbell was chairman of the state’s Iowa Power Fund. Jeff Kaufmann, the chairan of the Iowa GOP, today said Hubbell was a DuPont stockholder who should not have voted to give Iowa Power Fund money to DuPont Pioneer. Hubbell’s campaign said late this afternoon Hubbell had publicly disclosed his investments beforehand and noted the paperwork for the DuPont Pioneer grant was finalized a month after Republican Governor Terry Branstad took office. 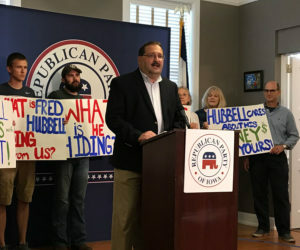 The Iowa GOP’s chairman, speaking during a news conference at party headquarter in Des Moines earlier this afternoon, said Hubbell should not have voted for a state grant that added to his own “bottom line” as a DuPont Pioneer investor. “This Power Fund is about attitude and arrogance and a lack of leadership,” Kaufmann told reporters. The Hubbell campaign said it’s hypocritical for Republicans to attack Hubbell for backing the grant to DuPont Pioneer since Republican Governor Kim Reynolds attended the Nevada ethanol plant’s opening in 2015, when she was lieutenant governor, and called the facility a “prime example of the spirit of innovation.” It closed in November of last year.